Carol Grayson whose late husband Peter Longstaff died at the age of 47 in 2005 after contracting hepatitis C and HIV from contaminated blood. A campaining widow says that the revelation that hundreds of files relating to contaminated blood were removed by Government officials and went missing "adds more fuel to the fire" that there was a cover up over the scandal. A Government Internal Audit Agency (GIAA) investigation conducted last year following the start of the Infected Blood Inquiry found around 950 files relating to blood policy had been "checked out" by staff going back years. Peter Longstaff who died at the age of 47 in 2005 after contracting hepatitis C and HIV from contaminated blood. The GIAA report has been released under Freedom of Information laws to campaigner Jason Evans, whose father died in 1993 having contracted hepatitis and HIV. The 29-year-old, who is suing the Government for negligence, said the removal of documents "probably goes back decades" and could form part of a Government cover-up. Carol Grayson, who is originally from Hartlepool and has also lived in East Durham, has spent decades campaigning over the scandal after her haemophiliac husband Peter died at the age of 47 in 2005 after contracting hepatitis C and HIV from contaminated blood. Carol Grayson with late husband Peter Longstaff who died at the age of 47 in 2005 after contracting hepatitis C and HIV from contaminated blood. 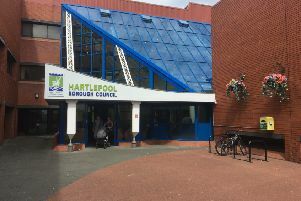 Peter, who was also born and grew up in Hartlepool, was one of at least 2,400 people who lost their lives after being given infected blood products in the 1970s and 1980s. Thousands of patients were infected with HIV and hepatitis C via contaminated blood products, many had haemophilia, a blood-clotting disorder, and relied on regular injections of clotting agent Factor VIII, which was made from pooling human blood plasma. Last September, the first UK-wide probe - the Infected Blood Inquiry - heard that more than 25,000 people could have been affected. Carol said 'missing and trashed blood policy files is an issue which has been raised by long standing campaigners including myself for three decades alleging a cover -up'. She added: "The most recent information on missing documents obtained under Freedom of Information by Mr Evans just adds more fuel to the fire. "The tragedy is that while Government used all manner of delaying tactics to avoid addressing the truth, victims went to their graves with many questions unanswered. "At last we have the Infected Blood Inquiry which I hope enables the truth to finally be heard. "For years, few wanted to listen to us and Government repeatedly refused contaminated blood victims a public inquiry on the grounds that "all the information is in the public domain". "I showed that this statement was false in 2006 when I wrote my dissertation critiquing a Department of Health report, using copies of documents I discovered which Government claimed had been "inadvertently destroyed" by a junior civil servant. "What was important wasn't so much what was in the Government's so called "definitive" report, but the enormous amount of evidence which was left out. "The report was finally disgraced as a "whitewash" and withdrawn on my evidence in December 2017." The GIAA report released to Mr Evans and dated November 6, 2018, said almost 1,000 files relating to blood policy had been checked out by officials. It said: "DHSC staff can check out paper files they need from the archives, (they) should return these once finished. "The records management (RM) team has identified that there are c.450 files relating to blood policy which have been checked out and not returned, and the RM team is currently working to recover these. "The team has put up posters around the DHSC offices, asking staff to return any files that they have checked out, and through an item in the DHSC bulletin, the RM Team has reminded staff to return files to storage if they are no longer used. "The RM team is planning a series of site visits to properties currently and previously held by DHSC, to identify any physical files located in these areas." The report said a separate group of 500 files was checked out from specific DHSC archives by "officers from the Department for Education (DfE) in 2006, and have not been returned". It said: "At present, there is no system in place to follow up on physical files which have been checked out from the archives by staff and which have not been returned in a timely manner." A spokesman said: "We are committed to being open and transparent with the Inquiry and have waived the usual legal privileges to assist the process. "We have already sent thousands of documents to the inquiry, and will continue to send more when necessary. "The inquiry has always been free to request any files they wish to review and we will ensure these are shared as soon as possible." He added: "The revelations in this new report prove that the ministerial statements were not true. "The undoubted question that arises now from victims and families is: why were the files removed, and was this part of a cover-up to prevent them knowing the full truth about what happened?" He added: "I had come across the odd file that had been removed in this way and thought it was suspicious, but I never would have imagined it could have been on this level. "We're talking about at least tens of thousands of documents within these files." And he said: "Nobody would have thought to go asking the Department for Education if they had relevant files, why would they?" Mr Evans' solicitor Des Collins, senior partner at Collins Solicitors, which is representing more than 1,000 victims, their families and seven campaign groups, said: "The sad fact is that despite 1,000 crucial files going 'missing', there is very little that will surprise me in relation to the facts in this important inquiry. "We know that there has been a Government cover-up. "We now have clear evidence that vast numbers of documents were removed and not returned. "We need to get to the bottom of why this happened, exactly what was in the files and what the people who in effect 'made them disappear' were trying to hide." Eleanor Gray QC, acting for the DHSC, told the inquiry that the treatment of information surrounding contaminated blood products has been "at worst, a cover-up, at best a lack of candour about past events". Former health secretary Lord Owen has said there was a "cover-up" and "incriminating evidence" had been suppressed by the Government to prevent victims taking legal action.